Is it snowing in Les Coches ?Thank you! Les Coches is situated in the heart of snow-sure Paradiski, one of the largest ski areas in Europe and offers you 425km of pistes and more than 2000m of vertical drop. Originally two distinct resorts - La Plagne and Les Arcs - the construction of the Vanoise express lift in 2003, the largest cable car in the world, joined the two areas into one domain - Paradiski. Situated in the heart of the the Paradiski domain, just a five minute ski from the Vanoise express lift on the La Plagne side, Les Coches is ideally placed for exploring both La Plagne and Les Arcs. The Village does not suffer from the over crowded feel of some of the larger resorts but still has a good choice of bars and restaurants plus shops and a covered skating rink. Les Coches is not aimed at the party going crowd, but more at people who appreciate skiing in a traditional French resort. Much of the accommodation offers Ski – In Ski – Out, which is another godsend for those who prefer not to start the day on crowded buses or walking for half an hour to get to the piste. The skiing is suitable for all abilities with gentle runs back to resort for beginners and a huge domain with two glaciers for snow-sure skiing for the experts. 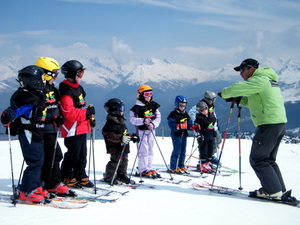 There are two ski schools with English speaking instructors and guides. Les Coches is different to another reviewer's report in many ways! Since her report back in 2012, it has added in new lifts and the run back to the village from Dos Rond and the beginner area at Plan Bois, is much easier than before, believe me. Some new cut throughs have been added at a couple of the more difficult pitches, making the run home easier for beginners especially. In good snow, from Dos Rond, try the Pierre Blanches run, which joins into the Mont Blanc, as this may be the easier option? The location of Les Coches and the access to Les Arcs is a big draw, as the variability in terrain that then becomes available, is huge. The trees around Les Coches also help in bad weather, if you are forced to go skiing! Les Coches is quiet(ish) in the evening, but there are enough good restaurants and a couple of bars that should be sufficient for most. Both schools (ESF & Evo'2) are good here too! We nearly always drive these days and Les Coches can be easily reached in 10 hours, from the Calais area. By travelling overnight on the Friday, this can then make extra skiing on the Saturday morning, very achievable. One note of caution, the valley road can be slow in peak holiday times! Prices are always going to be higher, the further up the mountain you go. However, with a car, the supermarkets in Bourg' are easily reached for a good range of "food" shopping if needed, making the self catering stay more affordable. There are very good catered chalet options available too. We have used Erna Low a lot in the past and also contacts within the village, but we now use Ski La Source more and more, with no complaints at all. We have tried catered chalets, self catering chalets and self catering apartments and we still mix it up, but are more biased theses days towards self catering options. We like Les Coches; it must have something going for it, as this will be my 18th season, but we do other ski areas whenever possible. So I feel we can make an honest comparison! Almost forgot, the ability to ski in/ski out of most of the accommodation, is fantastic here. Hope you enjoy Les Coches, as much as we do.